And yes, many economies rely on tourism and tourists, so we’re encouraged to go there. Greece, especially, has faced economic financial hardship in recent years. 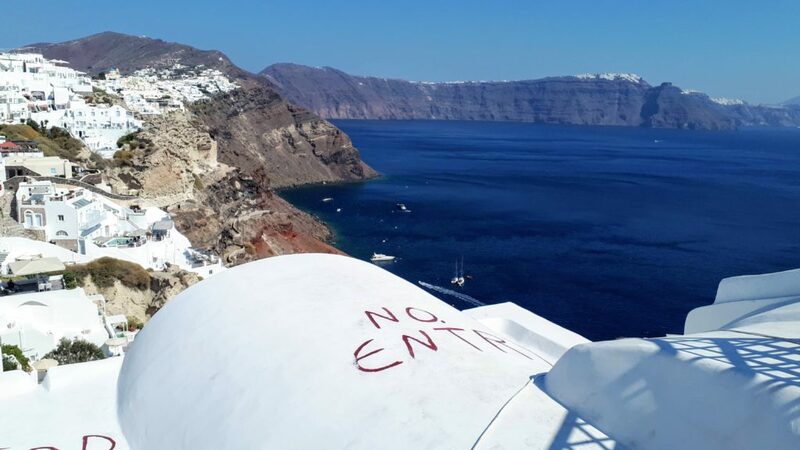 Is that why we planned our visit to Athens and Santorini? No. 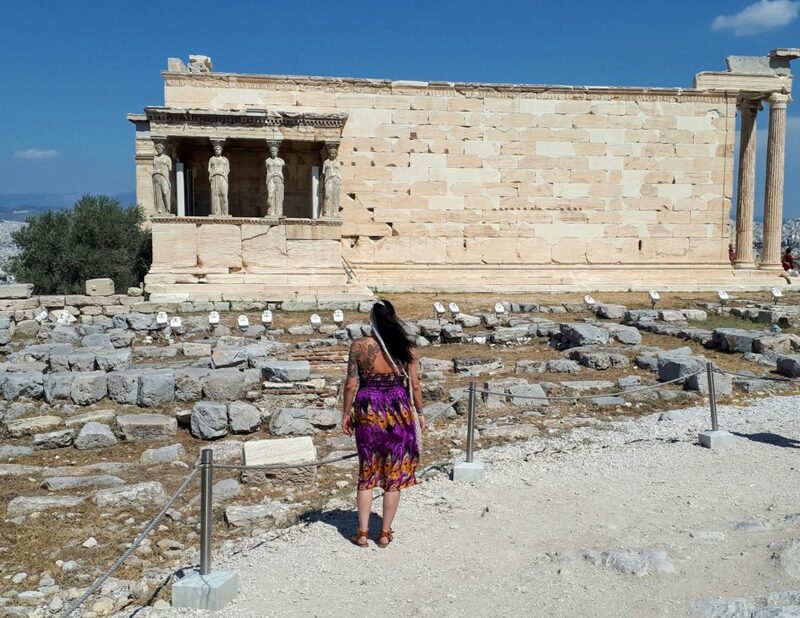 We did it because we wanted to see Ancient Greek ruins, revel in architecture, eat Greek dishes and drink in beautiful views. We’re encouraged to do that too. What we’re not encouraged to do is spoil it for the locals or other visitors. When we were in Santorini a couple of weeks ago, we saw plaques on street walls with the above message. The cynic in me thinks that these plaques have materialised as a result of tourists’ behaviour. Here’s why. 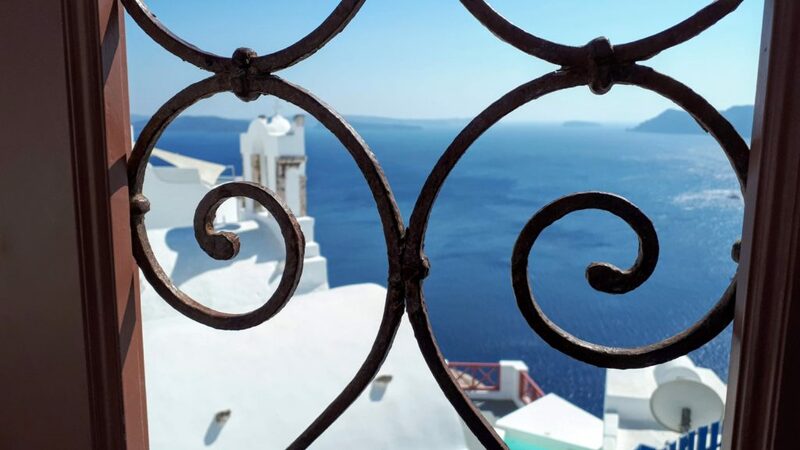 Oia, in Santorini, is the most beautiful place I’ve ever been to in my life. It defies logic, that’s how perfect it is. Whitewashed buildings, pastel churches, pink bougainvillea, the stark contrast between the black volcanic rock of the cliff face and the shimmering blue of the sea. Picture perfect. 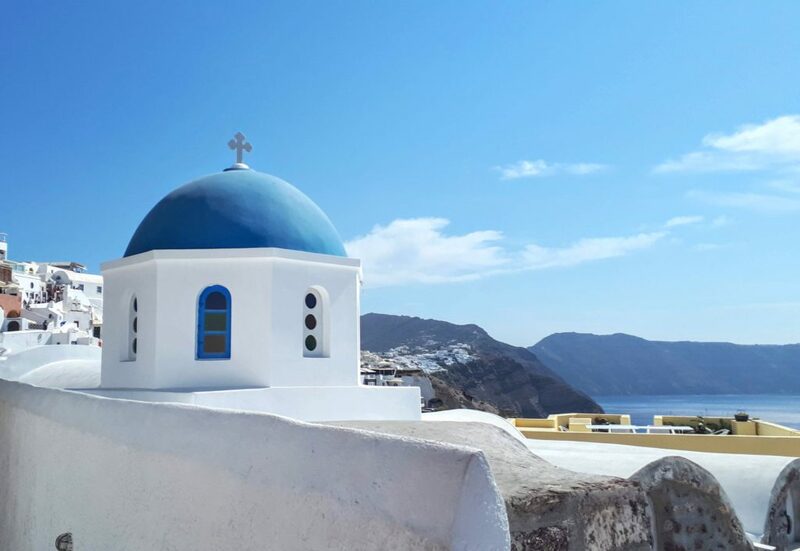 Oia is also renowned for it’s blue dome churches. It’s a place of Instagram dreams. And naturally people want to take photographs; either of the views or, in the case of the majority of people we saw, themselves. This won’t be a new grumble to you if you follow me on Twitter or Instagram, because I complained about selfish photograph taking whilst we were away. A lot of people seem to think they have a monopoly on beautiful photo spots. From a couple with a tripod taking pictures of themselves for a good 5 minutes in a prime spot at the Acropolis in Athens, to those stopping on the steps and halting the rest of the paying public trying to get access to the site, to people doing mini photoshoots in Oia whilst others queue for a picture of the location, there’s an element of arrogance. Don’t get me started on the amount of selfie sticks. It’s rude and self centred. I love beautiful photographs in beautiful places and sometimes I like to be in them. Hell, I even instructed asked the husband to take a couple of me (he did so somewhat grudgingly – he hates the self promotion “look at me” instagram culture). 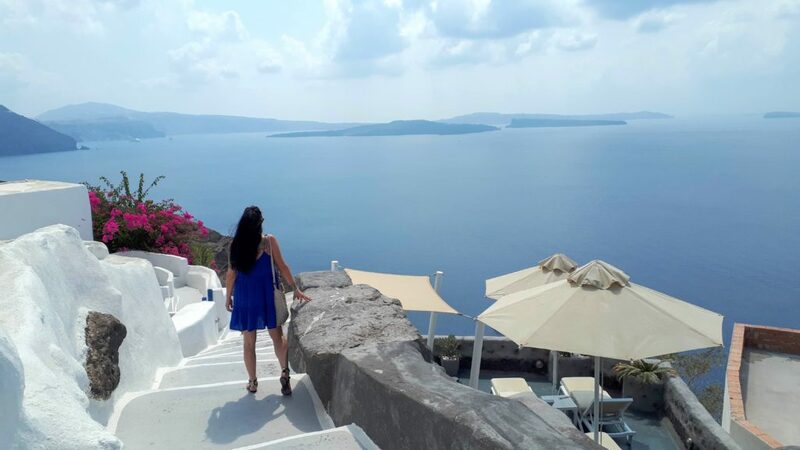 And here’s me looking out over the caldera in Oia. The difference is how you do it. Get your shot and move on. Dont spend ages looking at the camera viewer to review the picture when other people want to get their own photograph. Don’t spend ages doing different poses and angles. If you want to do that, then get there early or late when it’s quieter. The best / most popular locations are for everyone to enjoy and immortalise on camera. This location was a perfect example. There were always at least a couple of people waiting to get a photo. We dropped lucky here, as no way would the husband have queued for it! Beautiful, right? But look a little closer. Look at how the white paint is a little dirty on the curved part of the building to the right of the picture. That’s because people climb all over it to get that perfect insta shot. Grubby feet and sweaty hands pulling themselves up onto a religious structure. 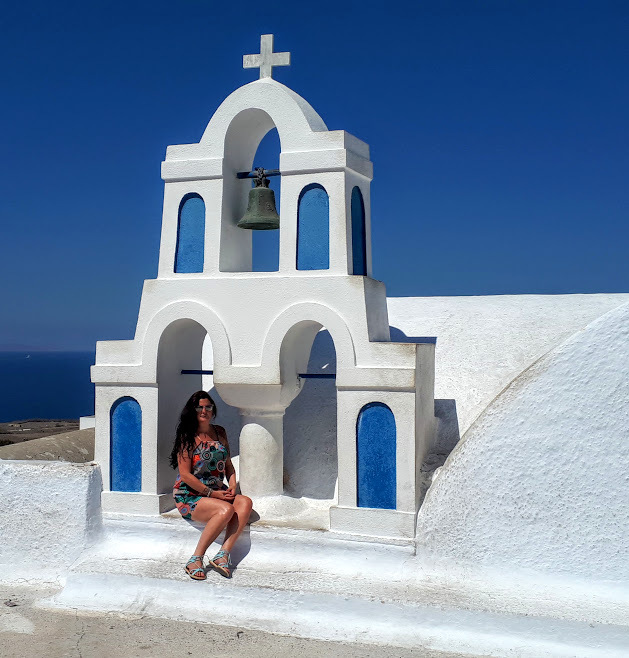 This blue domed church – an iconic Santorini site – had a sign which said “do not climb on the church”. People shouldn’t have to be told that. It should be common sense, and moreso, common courtesy. Down some pathways, locked gates and doorways are necessary to protect people’s privacy and property from marauding picture takers. And this, one of the most heartbreaking images I’ve ever seen on my travels. 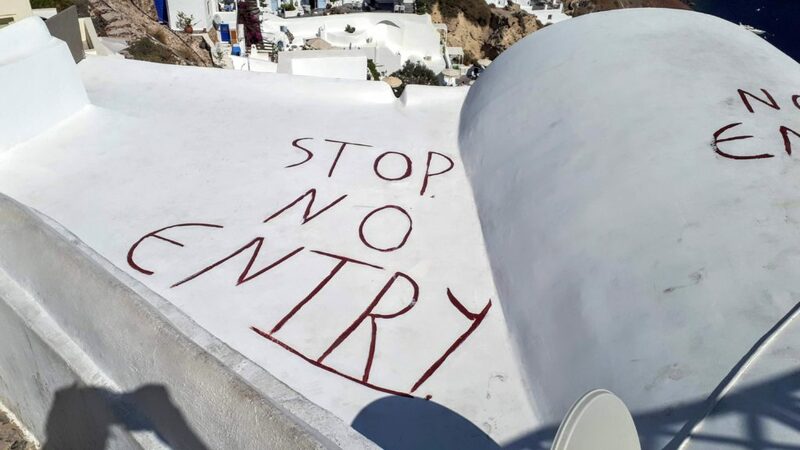 A property owner forced to deface their beautiful white building, and a beautiful view across Oia and the caldera, to stop people from trespassing. Obviously a sign just wasn’t enough. Isn’t that a depressing sight? See the sight, you don’t need to be the sight. A photo can be just as beautiful if you’re not in it! It’s there for everyone, not your personal location shoot. Don’t monopolise great views and spots for longer than necessary if other people are waiting. Be respectful. Building function comes before photos. Don’t climb on churches or statues. They may not mean anything to you, but to other people they’re much more than a pretty pic. Have you come across any tourist areas that have made you cross with how visitors behave? Or do you think all’s fair when it comes to capturing the perfect pic? Let me know in the comments. P.S *you may think I’m jealous or bitter about people who give up their life to travel. Not at all! I just don’t like it when those people have a snobbish attitude about holidaymakers, or staying in a nice hotel and eating in nice restaurants. I shared my thoughts about it a while ago; you can read the post here). You hit the nail on the head! I get annoyed on behalf of the people who live there. Although the people who make a living from tourism appreciate the visitors, they must appreciate the downtime once the season is over.